January 2: The Egyptian archaeological excavation mission at the ancient city of Buto in Kafr El-Skeikh Governorate unearthed remains of mud-brick walls, four furnaces and several other diversified artifacts. "Studies conducted on the newly uncovered wall remnants discovered that they may have once been part of the ancient Buto temple, while the furnaces were likely used to prepare offerings to the gods." stated Ayman Ashmawy, the ministry’s head of the antiquities sector. 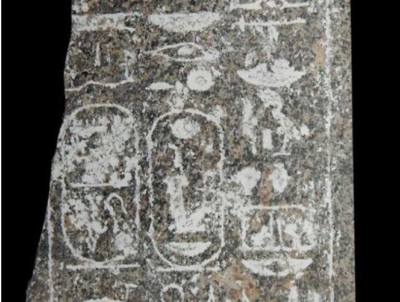 January 8: During a drilling operation to develop a parking lot in Akhmim, Sohag governorate a fragment of black granite statue of King Amenhotep III from the Eighteenth Dynasty was discovered. "The archaeological committee, which was formed under the chairmanship of Gamal Abdel Nasser, confirmed that preliminary examination showed that on the right foot f the statue, are hieroglyphic writings which represent the coronation and birth names of King Amenhotep III. 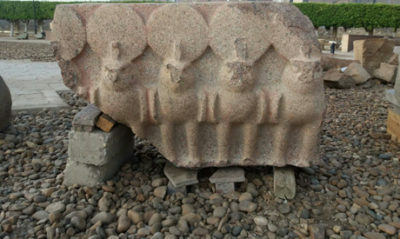 The artifact was transferred to Sohag Museum for restoration." declared a the Ministry of Antiquities. 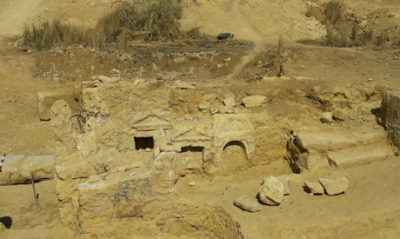 January 10: Throughout the course of an excavations carried out in the eastern section of the Hellenistic cemetery by an Egyptian archaeological mission working at Al-Abd land in Alexandria, several archaeological elements and remains of tombs, dating back to the Greco-Roman era, were revealed. "The most valuable of these discoveries is a tombstone that was once used to close one of the burial shafts. These remains are a collection of offering vessels and lamps ornamented with scenes of deities." said Mustafa Waziri, secretary-general of the Supreme Council of Antiquities January 11: American and Egyptian Archaeologists unveiled two major discoveries in Upper Egypt's Tel Edfu and Kom Ombo. A Fifth Dynasty royal administrative complex at Tel Edfu and two Ptolemaic era stelae at the Kom Ombo temple are among the finds. 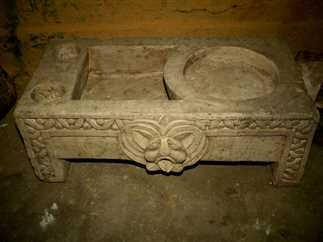 “It is the oldest archeological evidence to be found in Tel Edfu till now! The complex sheds light on the royal expeditions organized during the Fifth Dynasty reign of King Djedkare Isesi, who reigned from the late 25th to the mid-24th century BCE. ” affirmed Nadine Moeller, head of the American mission. 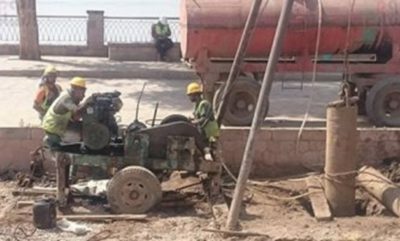 January 13: In the course of work carried out at San Al-Hagar archaeological site in Sharqiya governorate with a view to develop the site into an open-air museum, archaeologists stumbled upon a stelae of 19th Dynasty King Ramses II. 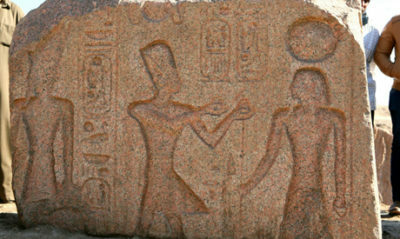 "The stelae is carved in red granite and depicts King Ramses II presenting offerings to a yet unidentified ancient Egyptian deity. 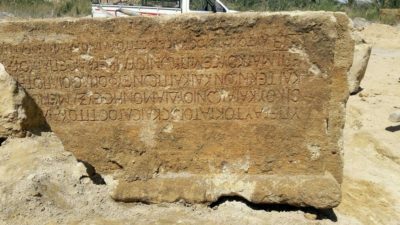 Although several foreign missions have worked on the site, it has never been completely excavated and was neglected, but this discovery will definitely encourage the Ministry of Antiquities to start a comprehensive development projects over here." said Mustafa Waziri. January 17: At the Al-Alamein archaeological site a tomb that dates back to the second century has been uncovered The discovered tomb contains a rock staircase leading down into the main chamber of the tomb, where burial holes known as “Locauli” are prominent. The southern part of the tomb contains a Greek decoration on the wall, depicting a horn with a basin surrounded by drawn on leaves and flowers. 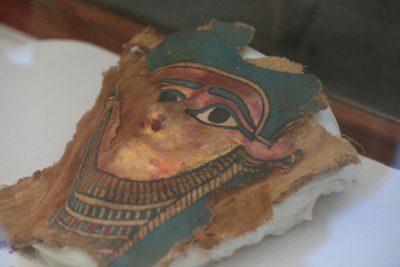 February 4: During excavation work at the Giza necropolis's western cemetery, on the southern outskirts of Cairo, a team of Egyptian archaeologists found a tomb that belonged to a woman named Hetpet and is over 4,300 years old, dating to the Fifth Dynasty of ancient Egypt's Old Kingdom. 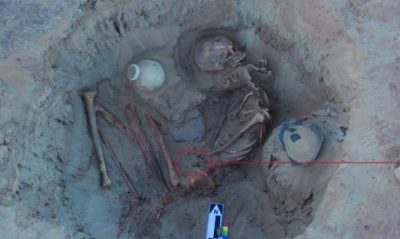 February 24: Egyptian Archaeologists have made the exciting discovery of a previously unknown necropolis, untouched for millennia. At over 2,000 years old, the cemetery dates back to the Pharaonic Late Period and the Ptolemaic dynasty, and contains at least 8 tombs, each with multiple sarcophagi. Located south of Cairo in the Minya Governorate, the newly discovered underground tomb complex is just six kilometres (3.8 miles) from the Khmun necropolis Tuna el-Gebel. 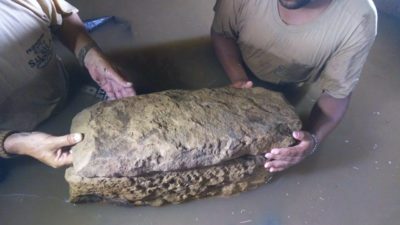 February 28: Parts of a statue of King Ramses II were unearthed by the Egyptian expedition working on the groundwater treatment project at the Kom Ombo Temple in Aswan. The found head showed King Ramses II wearing the white crown of pharaonic Upper Egypt. 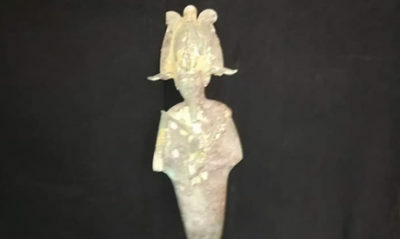 This discovery is considered so valuable due to the fact that it serves as new evidence of the existence and use of the Kom Ombo Temple during the Ancient Egyptian modern state-era. March 1: Researchers have uncovered the oldest figurative tattoos in the world on two 5,000-year-old mummies in Gebelein in the southern part of Upper Egypt, around 40km south of modern-day Luxor. The illustrations are of a wild bull and a Barbary sheep on the upper-arm of a male mummy, and S-shaped motifs on the upper-arm and shoulder of a female. "The discovery had "transformed" our understanding of how people lived in this era. Only now are we gaining new insights into the lives of these remarkably preserved individuals. Incredibly, at over 5,000 years of age, they push back the evidence for tattooing in Africa by a millennium." declared Daniel Antoine, one of the lead authors of the research paper and the British Museum's Curator of Physical Anthropology. 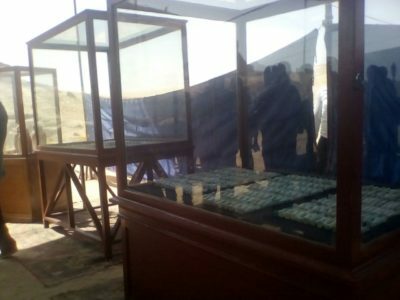 April 4: An Egyptian archaeological mission from the Supreme Council of Antiquities has dredged up the remains of a Graeco-Roman temple while carrying an excavation work at the Al-Salam archaeological site, about 50km east of the Siwa Oasis. 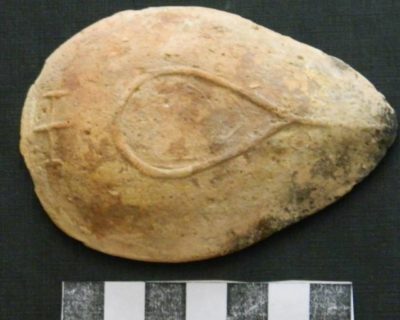 "During the removal of the debris from the site, the mission uncovered architectural elements including upper lintels decorated with scenes, as well as parts of corner pillars decorated with the egg-and-dart architectural device common in the Graeco-Roman era." acknowledged Abdel-Aziz El-Demery, the head of the archaeological mission. 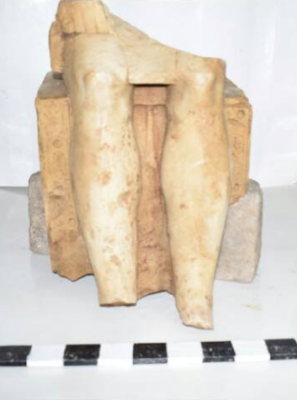 April 11: The Egyptian-German excavation mission at Matariya, Heliopolis, recently uncovered roughly 4,500 fragments of King Psamtek I's quartzite colossus, parts of which were first discovered last year at the nearby Souq Al-Khamis archaeological site. 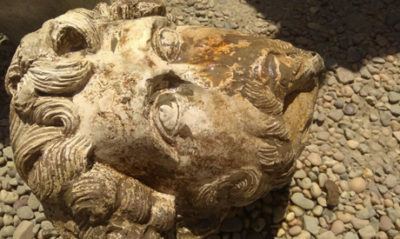 April 22: Two rare discoveries were unearthed in Upper Egypt, the Egyptian archaeological missions over there discovered at the southern side of Karnak Temples’ tenth pylon a marble head of Roman Emperor Marcus Aurelius in Aswan and an unusually positioned Osirian temple in Luxor. 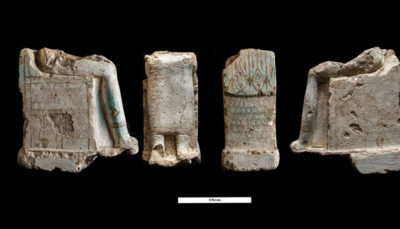 The archaeologists started revealing architectural elements of a Late Period shrine dedicated for god Osiris-Ptah-Neb. 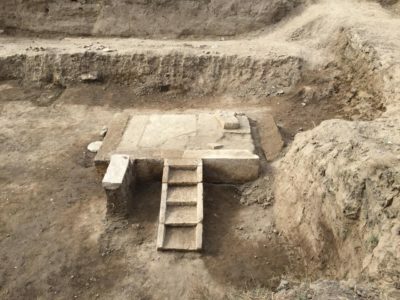 "The discovery is composed of an entrance, foundation remains, columns, inner walls, ruins of a third hall located at the eastern side, paving stones from the shrine floor, along with other extension structures built during a later period." stated Essam Nagy, head of the archaeological mission. 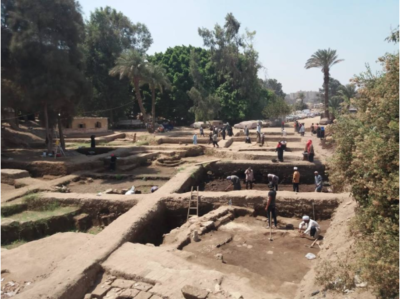 April 30: During the excavation work of the Ain Shams University archaeological mission; headed by Mamdouh al-Damati unraveled a celebration royal hall that goes back to the era of Ramses II. 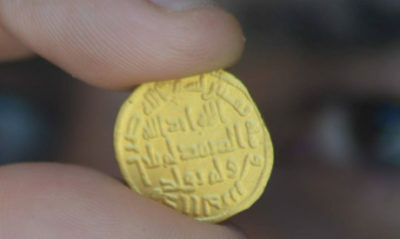 The discovery was in Arab El-Hassan in El-Matareya. May 9: A tomb of an ancient Egyptian army general that dates back 3,300 years was revealed at the Saqqara burial complex near Cairo. Human remains are yet to be found, but the team of archaeologists did unearth a number of rooms, including chapels, a forecourt and 'statue room.' "The burial site is believed to belong to a man called 'Iwrhya', who is thought to have been a decorated war hero. Hieroglyphs inscribed on the tomb walls tell stories of the great soldier, who served under two different pharaohs: Seti I and Ramasses II." Stated Ola El Aguizy, a professor of Egyptology at Cairo University who excavated the tomb. 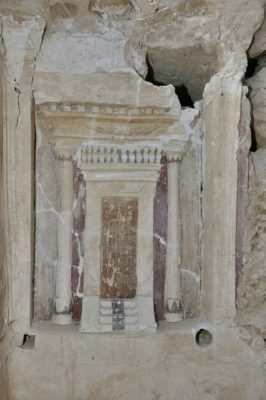 May 11: The Egyptian archaeological Mission of the Ministry uncovered another Roman temple at Al-Hag Ali village near Siwa oasis. They dated the remains to the second century or, more specifically, the reign of Emperor Antonius Pius. 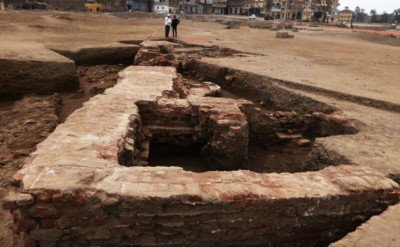 May 24: Parts of a huge red brick building that dated back to the Greco Roman era in the Nile Delta province of Gharbia was discovered. July 1: A statuette of Osiris was found in a small crevasse between the huge blocks of the pyramid’s eastern façade during restoration work being carried out on the eastern side of the King Djoser Step Pyramid in Saqqara. July 3: Throughout the course of the restoration and renovation work at the Greco-Roman Museum in Alexandria, a cache of hundreds of pottery vessels was discovered under the interior garden known as the Patio. 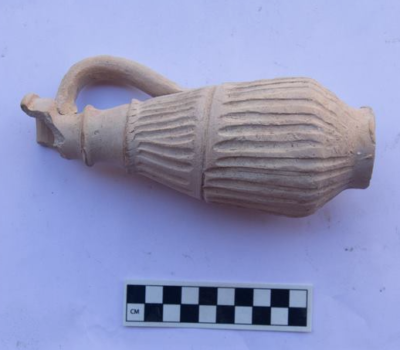 The cache included vessels that date to back to an extended period of Egypt’s history: the earlier Greco-Roman era, the Coptic era and the Islamic era. July 10: An ancient city dating back to the Greco-Roman era was discovered in Minya governorate. The uncovered city contains many ancient tombs carved in rocks, and extending to about 2 kilometres and 600 meters in width, as well as Greek-Roman columns, a church, and a cross. 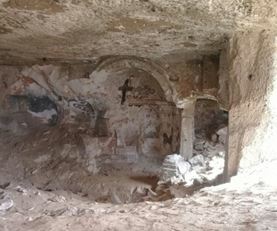 July 12: The Egyptian archaeological mission uncovered during rescue excavations, carried out in Mitt Abu al-Kom, an archaeological site that includes several chambers dating back to the Roman and Byzantine periods. July 14: The Egyptian-German mission did a tremendous job in unraveling five stone coffins at Saqqara area. They uncovered a complete mummification workshop which contains burial chambers with mummies dating back to the 26th and 27th dynasty. 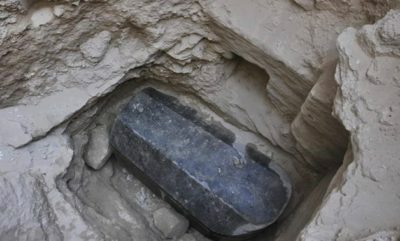 July 19: The opening of the mysterious sarcophagus, amid rumors of a "possible curse" that could be cast on the world once the sarcophagus is opened. 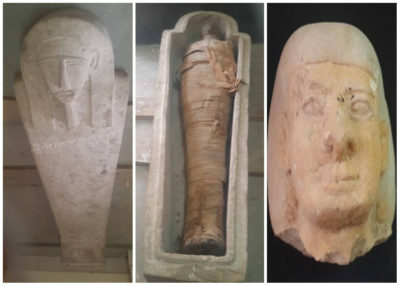 Three decomposed mummies were found in the sarcophagus. None of the three mummies belong to a Ptolemaic or Roman royal family and the coffin does not have inscriptions or a cartouche bearing their names. 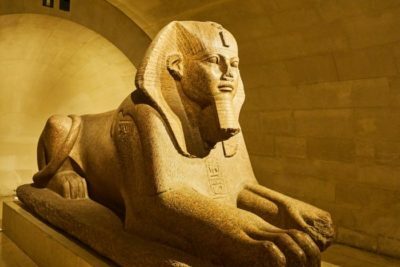 August 9: A new large sphinx has been discovered in Luxor, Egypt. The ancient statue has a "lion's body with a human head". The sphinx, dating to 2500 B. C and the reign of the Pharaoh Kafre in Egypt was found when workers accidentally dug up the renowned artifact during road works. August 15: While the Egyptian Commission affiliated with the Ministry of Antiquities was undergoing their current works of removing groundwater from under the Temple of Kom Ombo in the city of Aswan, south of Egypt, the unearthed two ancient pieces made of mud-sand that date back to the Ptolemaic era. September 2: Archaeologists have unearthed one of the oldest villages ever found in the Nile Delta. The Antiquities Ministry indicated that this ancient village predated the era of the pharaohs, which means that humans were living in the area as early as 5,000 B.C. before Giza's pyramids were built! This is unquestionably a major discovery. 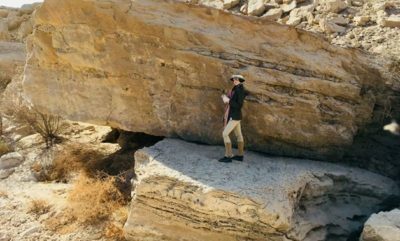 "Analyzing the biological material that has been discovered will present us with a clearer view of the first communities that settled in the Delta and the origins of agriculture and farming in Egypt," said Nadia Khedr, a ministry official responsible for Egyptian, Greek and Roman antiquities on the Mediterranean. September 5: The Egyptian archaeological excavation mission working in the Lisht, the site of the Middle Kingdom’s royal and elite burials, uncovered a stone cemetery, roughly 300 meters northeast of the pyramid of King Senusert I "The cemetery is sculpted on the rocky edge of a mountain, and consists of two sectors, the first is an open yard, leading to a vaulted corridor with some hieroglyphic inscriptions, and a cross-sectional hall. The second area is a burial crypt, located in the open yard in front of the cemetery." declared Adel Okasha, director of the Central Department of Antiquities of Cairo and Giza. 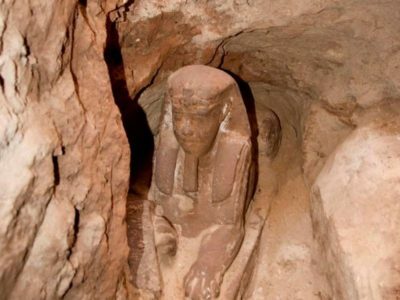 September 16: During an archaeological mission in its excavation to reduce the ground water level in at the Kom Ombo Temple in Upper Egypt's province of Aswan, a sandstone Sphinx statue was unearthed. 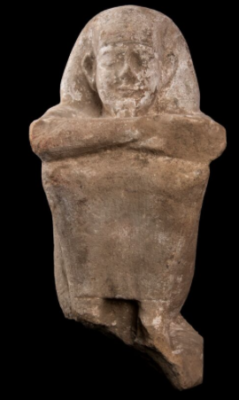 "The statue dates to the Ptolemaic era as it was found on the southeastern side of the temple, where two sandstone reliefs of King Ptolemy V were digged out two months ago." said Mustafa Waziri, general secretary of the Supreme Council of Antiquities. September 18: Excavations executed by an Egyptian mission near the Aga Khan Mausoleum on Aswan's west bank found an anthropoid sandstone sarcophagus with a mummy inside of a Late Period tomb. 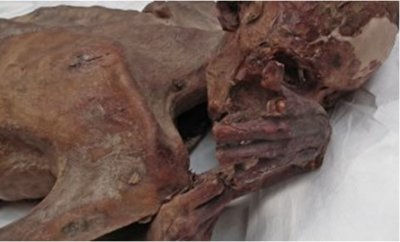 "The mummy is in a very good conservation condition, and wrapped in linen among other things." said Mustafa Waziri. September 20: Twenty tombs from the Graco-Roman period dating back to late ancient Egypt and early Christianity were discovered. 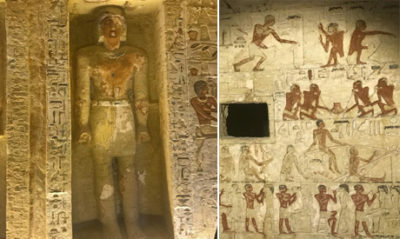 Three other tombs were found in the area where remains of clay sarcophagi were unearthed, some of which have paintings while others are inscribed with hieroglyphic texts. During the archaeological cleaning of the tomb the mission found a collection of mummies haphazardly buried, suggesting that the tomb was used as a communal burial. Also the head of an unidentified sandstone statue was also uncovered along with a collection of amulets made of faience. 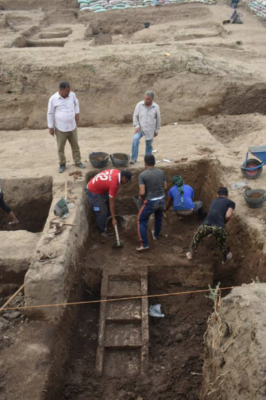 September 25: An Egyptian archeological mission operating in Mit Rahina announced the discovery of a huge archaeological building in the Hoad al-Demerdash area, about 400 meters north of the Mit Rahina museum in Giza. "It is most likely part of a residential area. The building is made of bricks supported by massive limestone block, with its foundations, external walls and inner staircase constructed using red bricks." Said Mustafa Waziri. 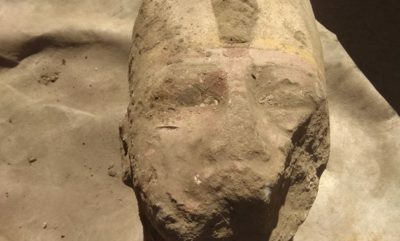 September 27: The Egyptian Archaeological Mission working in Al-Asasif region, west of Luxor, under the supervision of the Ministry of Antiquities, discovered two ancient tombs seating two mummified corpses. 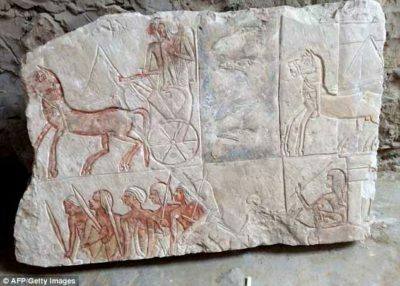 October 1: An Egyptian archaeological mission at the Kom Ombo Temple in Aswan has unearthed two ancient sandstone paintings in Upper Egypt's province of Aswan. "The first painting belongs to King Seti I of the 19th Dynasty, who ruled Egypt from 1290 to 1279 BC, while the other one belongs to King Ptolemy IV who ruled Egypt from 221 to 204 BC. The first painting was found broken into two pieces but the drawings and inscriptions were still in good condition." stated Mustafa Waziri. 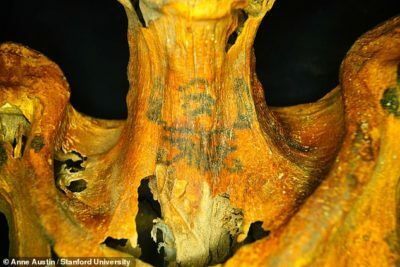 October 17: Tattooed remains of a mummified woman belonged to a magical priestess who lived 3,000 years ago were found in Deir el Medina near Egypt's Valley of the Kings. The mummy is covered with around 30 ancient tattoos. Scientific and archaeological studies reveal that it is the mummy of a woman who probably lived between 1300 and 1070 BC and died when her age ranged between 25 and 34 years. A woman who tattooed her body during the time of the pharaohs was a highly respected religious leader." indicated Mustafa el Waziri. October 25: The archaeological mission working at an archaeological site in El-Matareya found a full ancient royal celebration hall dating back to the era of Ramses II. November 6: A number of inscription fragment and fragments of smaller statuary were unearthed by an Egyptian–German archaeological mission at the Temple of the Sun in Matariya, in piles close to lime burning installations. "The discovered fragments date back to the 12th and 20th dynasties as well as the Third Intermediate Period." Announced Ayman Ashmawy, head of the Ancient Egyptian Antiquities sector at the Ministry of Antiquities and head of the Egyptian side of the mission. 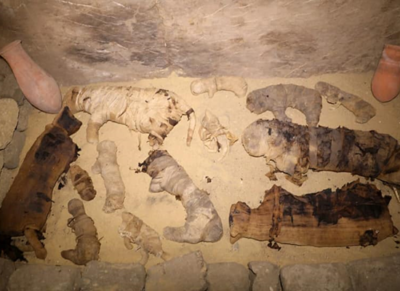 November 10: Three tombs dating back to the Pharaonic modern-state era of Egypt and four other ancient ones containing a group of artifacts including mummified cats "Bastet", were unearthed at Giza's Saqqara necropolis. "This step marks the beginning of a great archaeological discovery in the area. The artifacts will be displayed at Imhotep Museum of Saqqara starting from November 15." 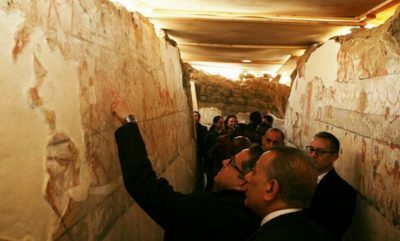 Said Khaled Anani, Antiquities Minister. 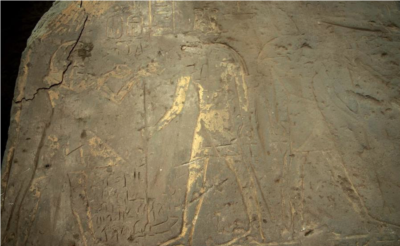 November 14: A tomb of a woman and her fetus dating back 3,700 years was uncovered at Kom Ombo, Aswan. December 7: A burial seated as the east of the Prince Waji's tomb was uncovered by the archaeological site of al-Khalwa area, Fayoum. 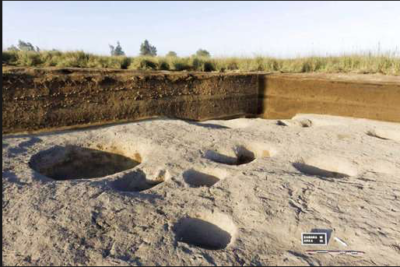 The burial dates back to the Middle Kingdom "Al-Khalwa, located at southern Fayoum, contains a cemetery dating back to the Middle Kingdom era, namely Amenemhat III era (1842-1799 BC)." said Mustafa Waziri. 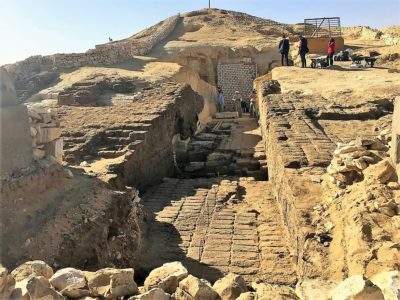 December 13:The cemetery of a pharaonic community dating back to the era of the 18th dynasty in the Gebel el-Silsila area of Kom Ombo during excavation was discovered by the Swedish Archaeological Mission. 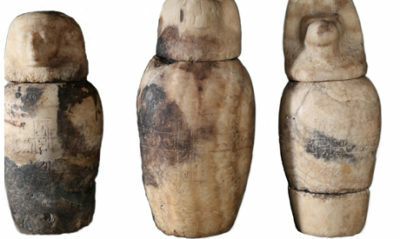 "The mission found three limestone coffins, scarabs, amulets and skeletons of around 50 adults and children, indicating that an integrated pharaonic community had been living in the Gebel el-Silsila area." declared Abdel Moneam Saed, General Director of Aswan and Nubia Antiquities. 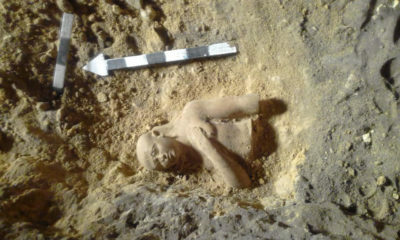 December 15: An Egyptian archaeological mission uncovered at the Sacred Animal Necropolis in Saqqara, the tomb of a royal purification priest, belonging to the Fifth Dynasty, called “Wahtye” from the reign of King Nefer Ir-Ka-Re. 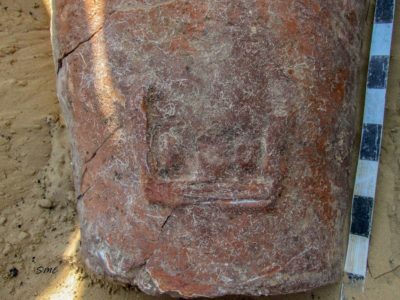 December 30: A reservoir of red and cylindrical clay coffins dating back to the Roman era was unveiled in Tel el-Deir archeological site in Damietta by an Egyptian archeological mission affiliated to the Ministry of Antiquities. We all hope that Egypt in 2019 will witness even more archaeological discoveries!